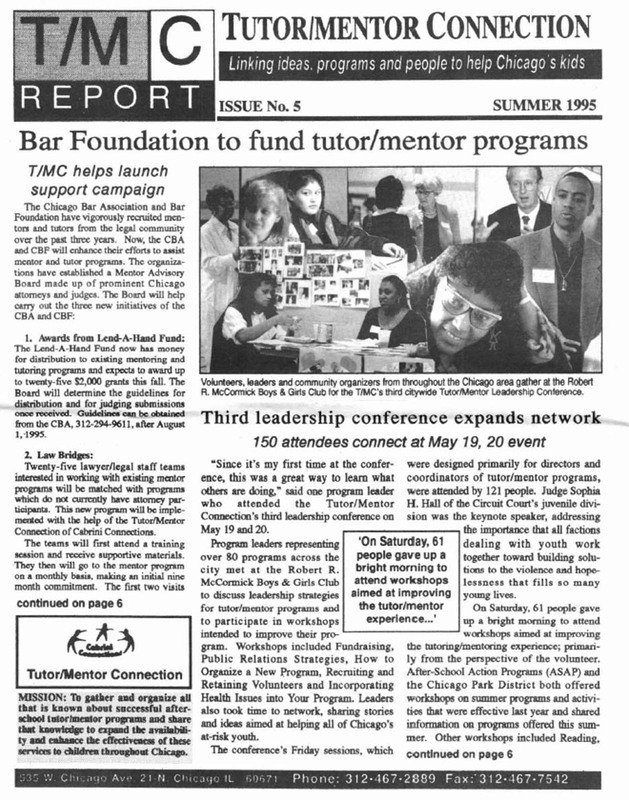 From 1993 through 2001 the Tutor/Mentor Connection created 8 and 12 page printed newsletters that were sent three times a year to tutor/mentor programs, supporters, researchers, business and faith leaders, etc. and those who are affected by urban poverty. The distribution list was under 1000 people in 2004 but grew to reach more than 9,000 per issue by 2001. The Tutor/Mentor Connection (T/MC) strategy is now led by Tutor/Mentor Institute, LLC. The goals are the same. The reasons to do this work have not changed. See more printed newsletters from 1994 through 2004. click here to enter GoogleDoc file. Note: Address and all contact information in these printed newsletters is now different from what is shown in these newsletters.